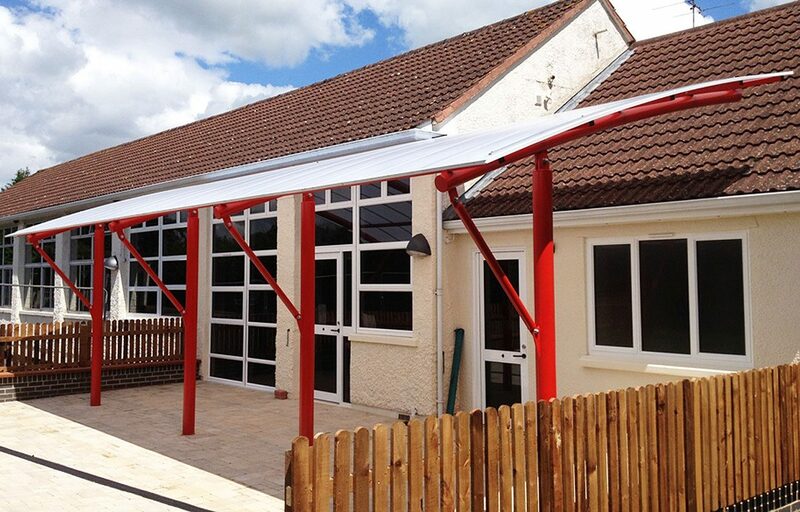 Steel cantilevered canopy for Andoversford Primary School. We produced this cantilevered steel canopy for Andoversford School. It creates a covered playspace and shades the existing school building to prevent overheating in the summer. The structure has been powder coated to reflect the school’s colours. Completed with a polycarbonate roofing solution, it is designed for an endless range of glazing and roofing applications, plus extreme weather conditions. Known for its light transmitting (32%) and reflective qualities. The structure is attractive, durable and easy to install. This structure has a 25 year guarantee. All of our steel work is designed and manufactured by our in-house technical team, meaning precision in design and engineering and speed of manufacture for your convenience. Fordingbridge is a fully CE mark approved manufacturer of steel fabrications. Roof: Hard-wearing translucent 16mm triple walled polycarbonate. This covering has an expected life of 15 years is fire retardant and gives high UV protection.